Temperature: controlled by constant temperature water (0-100°C). 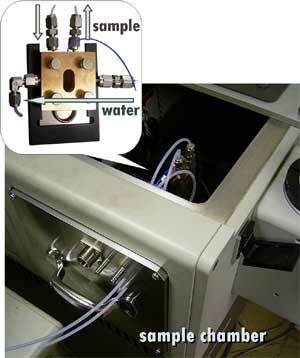 Sample: introduced from outside and circulated through the cell so that the sample is always kept under 1 atm and sample can be changed without opening the evacuated chamber. What do we study with this setup? Vibrational frequencies of molecules in solution are always fluctuating around mean values via interactions with surrounding solvent molecules. These frequency fluctuations cause vibrational dephasing and give rise to band broadening. Thus, vibrational spectra measured by IR or Raman spectroscopy reflect these interactions thorough their band shapes. Dynamical information on intermolecular interactions and hence on the local environments of probe molecules can be obtained by analyzing their vibrational bandshapes. Fig. 3. 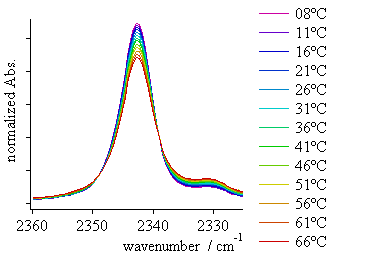 Temperature controlled infrared spectra of CO2 in bmim[PF6]; the bandshape approaches a Lorentzian with increasing temperature, i.e., motional narrowing occurs.